A variety of anomalies in tooth size, shape, and number can occur during development of the dentition. These anomalies can cause defects in tooth number, shape, size, structure, or position. Anomalies of tooth number include hypodontia (decreased number of teeth) or hyperdontia (increased number of teeth; supernumerary). Anomalies of tooth shape include germination (teeth sharing the same pulp chamber), taurodontism (tooth with a large pulp chamber and short roots), root fusion (multi-rooted teeth with separate pulp canals but with roots joined at the dentin), or root dilacerations (angulation of the dental root). Anomalies of tooth size include microdontia (tooth smaller than normal) and macrodontia (tooth larger than normal). Anomalies of tooth position include transposition (exchange in the position of two adjacent teeth), impaction (insufficient eruption of a tooth), ectopia (eruption of a tooth in an abnormal course), or rotation. Dental anomalies can present as part of a syndrome or isolated and can be caused by recessive or multifactorial inheritance, new mutations or stochastic events. They can be a result of genetic disturbances before birth or during postnatal tooth development. Postnatal factors that can affect tooth development include trauma to the primary dentition or the alveolar bone, nutrition., Dental anomalies tend to occur more in the permanent dentition and can be correlated to gender, socioeconomic status, and body mass index. Furthermore, a correlation between size and shape defects has been suggested. Dental anomalies can be identified through clinical or radiographic examination. Traditional radiographs are useful in the diagnosis of shape, size, and position anomalies; however, tools such as cone-beam computed tomography offer a better visualization of tooth position anomalies. Complete radiographic examination is a routine practice in dentistry and allows the clinician to identify dental anomalies in patients, that should be taken into consideration during treatment planning. This study assessed the prevalence and characteristics of dental anomalies in a specific population. The study also determined the correlation between the dental anomalies and gender or ethnicity. A retrospective study was performed from 2925 radiographs of patients between 17 and 60 years of age collected from the database of the Diagnostic Clinic at RAK College of Dental Sciences. The study was approved by the RAK Medical and Health Sciences University Research Ethics Committee (RAKMHSU-REC-05–15-UG-D). The exclusion criteria included patients with syndromes that could cause developmental dental defects; soft-tissue defects; and nondevelopmental dental defects; radiographs belonging to patients younger than 17 years were excluded to avoid misinterpretation caused by delayed eruption of permanent teeth in young patients; radiographs belonging to patients older than 60 years were excluded to avoid misinterpretations due to the regressive alterations or other dental diseases in older individuals to reduce radiographic misinterpretation; incomplete files; and blurred radiographs. All radiographs were taken using the same X-ray device and the same standardized method. The panoramic images were examined under good lighting conditions with standardized screen brightness and resolution. Repeatability was tested on 20 randomly selected radiographs examined at least 2 weeks after the initial examination. The selected radiographs were reviewed for the following dental defects: hypodontia, hyperdontia, germination, taurodontism, root fusion, root dilacerations, microdontia, macrodontia, transposition, impaction, ectopia, rotation, and any other unusual dental conditions. The universal numbering system was used to label the affected teeth. Third molar impaction was not considered in this study. The data were analyzed using descriptive statistics to assess prevalence and distribution of the anomalies. Comparison of the prevalence of specific anomalies was performed using Chi-square test, with a level of significance set at 5% (P < 0.05). A total of 400 (14.7%) of the radiographs screened presented dental anomalies. Within the 400 radiographs examined, a total of 170 (5.8%) of the cases were included in the statistical analysis after application of the exclusion criteria. From the 198 cases, 11 types of defects were detected [Figure 1]a and [Figure 1]b. Anomalies of tooth shape, position, number, and size had a prevalence of 32%, 26%, 21%, and 6%, respectively. Macrodontia and transposition were not found in any of the studied cases; however, retained primary teeth were observed. The most common anomalies observed were hypodontia (n = 37; 19%) and root dilaceration (n = 31; 16%) [Figure 1]b. The least common anomalies were hyperdontia (n = 5; 3%), taurodontism (n = 5; 3%), and persistence of primary teeth in permanent the dentition (n = 2; 1%) [Figure 1]a. There was no significant divergence in the gender distribution of the reported anomalies [Table 1]. Gemination was the only anomaly which a relatively higher occurrence in males than in females. A significant higher incidence of dental anomalies was observed in Syrian and Pakistani patients. A greater variety of anomalies were observed in the Syrian section of the studied population where all the reported anomalies were observed. The distribution of the observed anomalies by specific tooth number is detailed in [Table 2]. The teeth that were found to be most affected by dental anomalies were the maxillary third molars. The right and left maxillary third molars accounted for 23% of the anomalies observed. The tooth most affected by hypodontia was the right maxillary third molar (24%) whereas the teeth most affected by hyperdontia were the mandibular premolars (80%). Fusion and microdontia were seen frequently in the left and right maxillary third molars, germination was observed in the maxillary and mandibular molar region, and taurodontism was observed mostly in the mandibular molar region. Dilacerations were frequent in the right and left mandibular canines and premolars. The most commonly impacted or rotated teeth were the maxillary and mandibular canines. The most frequently ectopically erupted tooth was the left lower third molar (33%). Supernumerary teeth and taurodontism are not highly prevalent dental anomalies.,,,,,, The majority of supernumerary in our data were parapremolars, although the most commonly found supernumerary tooth tends to be mesiodens., Taurodontism can have a variable distribution among different teeth and tends to occur in more than one teeth on the same patient when associated with syndromes., The studied sample excluded syndromic patients which further explains the low prevalence of the anomaly. The limitations of this study include the heterogeneity of the studied population and the limited information on possible etiological factors. In addition, this study was limited to the analysis of panoramic radiographs and patient history. The possibility of misdiagnosis of dilaceration is greater with panoramic radiographs as it is difficult to identify the root angulation in labial and lingual directions. Structural anomalies were not considered in this study, as it would be difficult to detect them in panoramic radiographs. The prevalence of dental anomalies in the studied population is relatively low and evenly distributed among genders. The most commonly affected teeth are the maxillary and mandibular third molars. In the studied population, the incidence and diversity of anomalies were greater in patients who identified themselves as Syrians. Knowledge of the prevalence of dental anomalies and their distribution can contribute to accurate diagnosis and treatment planning in dental clinics of the region. Ishida R, Mishima K, Adachi C, Miyamoto A, Ooshima T, Amari E, et al. Frequency of the developmental disturbances of tooth structure. Shoni Shikagaku Zasshi 1990;28:466-85. Sejdini M, Çerkezi S. Dental number anomalies and their prevalence according to gender and jaw in school children 7 to 14 years. Open Access Maced J Med Sci 2018;6:867-73. Klein OD, Oberoi S, Huysseune A, Hovorakova M, Peterka M, Peterkova R, et al. Developmental disorders of the dentition: An update. Am J Med Genet C Semin Med Genet 2013;163C:318-32. Thesleff I. The genetic basis of tooth development and dental defects. Am J Med Genet A 2006;140:2530-5. Karataş MS, Sönmez IŞ. Developmental disturbances of a maxillary central incisor due to trauma to its predecessor: A case report. Med Princ Pract 2013;22:590-2. Basha S, Mohamed RN, Swamy HS. Prevalence and associated factors to developmental defects of enamel in primary and permanent dentition. Oral Health Dent Manag 2014;13:588-94. Mahesh R, Kanimozhi IG, Sivakumar M. Dilaceration and Eruption Disturbances in Permanent Teeth: A Sequelae of Trauma to Their Predecessors-Diagnosis and Treatment Using Cone Beam CT. J Clin Diagn Res 2014;8:ZD10-2. Shokri A, Poorolajal J, Khajeh S, Faramarzi F, Kahnamoui HM. Prevalence of dental anomalies among 7- to 35-year-old people in Hamadan, Iran in 2012-2013 as observed using panoramic radiographs. Imaging Sci Dent 2014;44:7-13. Yassin SM. Prevalence and distribution of selected dental anomalies among Saudi children in Abha, Saudi Arabia. J Clin Exp Dent 2016;8:e485-90. Kathariya MD, Nikam AP, Chopra K, Patil NN, Raheja H, Kathariya R, et al. Prevalence of dental anomalies among school going children in India. J Int Oral Health 2013;5:10-4. Patil S, Maheshwari S. Prevalence of impacted and supernumerary teeth in the North Indian population. J Clin Exp Dent 2014;6:e116-20. Nabavizadeh M, Sedigh Shamsi M, Moazami F, Abbaszadegan A. 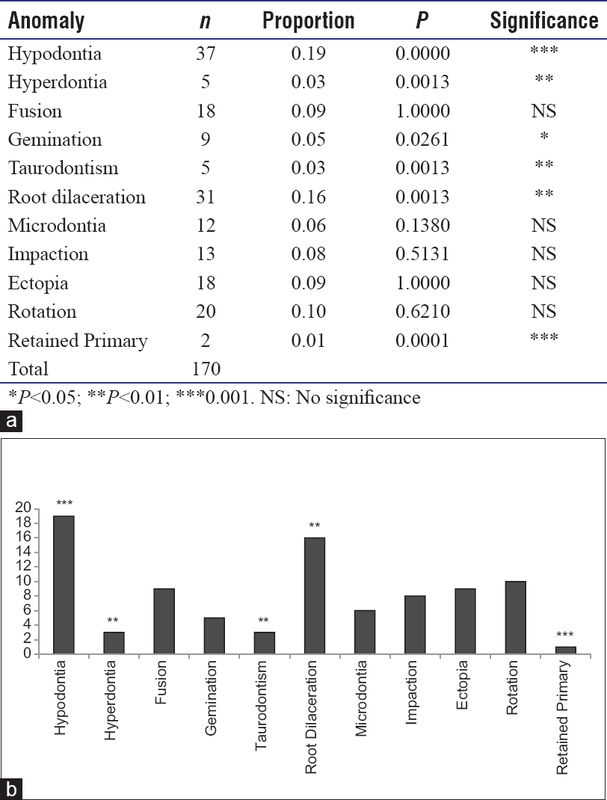 Prevalence of root dilaceration in adult patients referred to Shiraz dental school (2005-2010). J Dent (Shiraz) 2013;14:160-4. Luder HU. Malformations of the tooth root in humans. Front Physiol 2015;6:307. Nandimandalam VV, Sanaa S, Faisal MT, Ali MI. Prevalence of developmental dental anomalies among adult population of Jazan, Saudi Arabia. Saudi J Dent Res 2016;7:29-33. Haskova JE, Gill DS, Figueiredo JA, Tredwin CJ, Naini FB. Taurodontism – A review. Dent Update 2009;36:235-6, 239-40, 243. Fardi A, Kondylidou-Sidira A, Bachour Z, Parisis N, Tsirlis A. Incidence of impacted and supernumerary teeth-a radiographic study in a North Greek population. Med Oral Patol Oral Cir Bucal 2011;16:e56-61. Syriac G, Joseph E, Rupesh S, Philip J, Cherian SA, Mathew J, et al. Prevalence, characteristics, and complications of supernumerary teeth in Nonsyndromic pediatric population of South India: A Clinical and radiographic study. J Pharm Bioallied Sci 2017;9:S231-6. Dineshshankar J, Sivakumar M, Balasubramanium AM, Kesavan G, Karthikeyan M, Prasad VS, et al. Taurodontism. J Pharm Bioallied Sci 2014;6:S13-5. Temilola DO, Folayan MO, Fatusi O, Chukwumah NM, Onyejaka N, Oziegbe E, et al. The prevalence, pattern and clinical presentation of developmental dental hard-tissue anomalies in children with primary and mix dentition from ile-ife, Nigeria. BMC Oral Health 2014;14:125.